Paradoxically, a stronger economy means a tougher borrowing environment. Canada’s economy is red-hot these days. And that’s the principal reason why Canadians could see mortgage rates rising before the end of the year. 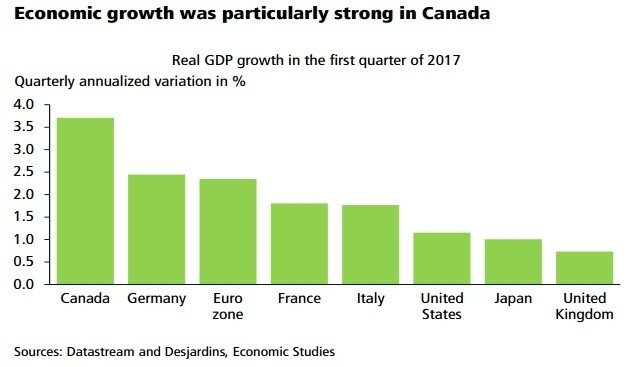 In the first quarter of this year, Canada recorded a 3.7-per-cent annualized pace of economic growth, the strongest among G7 countries. Canada added 77,000 full-time jobs in May, and over the past year, the country has seen total jobs increase by 1.8 per cent, faster than population growth. When an economy strengthens, there is less slack and inflation typically picks up. When inflation picks up, central banks raise interest rates. So far, inflation has been tepid in Canada. But every sign points to that changing soon. Bank of Canada Governor Stephen Poloz said this week that the low interest rates put into place in 2015 to fight the oil price collapse have “done their work.” That is as clear a sign as you’re going to get from a central banker that they are leaning towards raising rates. "Recent events, particularly the noticeable change in the Bank of Canada’s tone, have reinforced our belief that a gradual rise in rates should begin shortly,” they wrote in a report Thursday. What it all means is that “ultra-low (mortgages) are probably, for the most part, over,” mortgage broker Ian Macfayden told CTV News. The Bank of Canada’s lending rate most directly affects variable-rate mortgages. Fixed-rate mortgages are affected by U.S. lending rates — and those are already on the rise, with the Federal Reserve raising its overnight lending rate to 1.25 per cent this week. Canada’s key lending rate remains at 0.5 per cent. For those with a fixed-rate mortgage, the impact of higher interest rates won’t be felt until it’s time to renew. But those holding variable rate mortgages could start paying more in interest, and less towards capital, as soon as rates rise. And of course, those in the market for a home will be able to afford less mortgage. James Laird, co-founder of mortgage comparison site Ratehub, says you need to be able to handle fluctuating rates if you want a variable rate mortgage, which these days offer a mortgage rate that’s about 0.5 percentage points lower than a fixed-rate mortgage. But those worried about rising rates would be well-advised to lock in a rate for the long term. “Rates might go up much faster than anyone is expecting and so if you're right on the border of being able to afford your mortgage payment and you're able to lock in an affordable payment for five years, you should definitely do that,'' Laird said.